Dear Friends of the Creativity Shell! 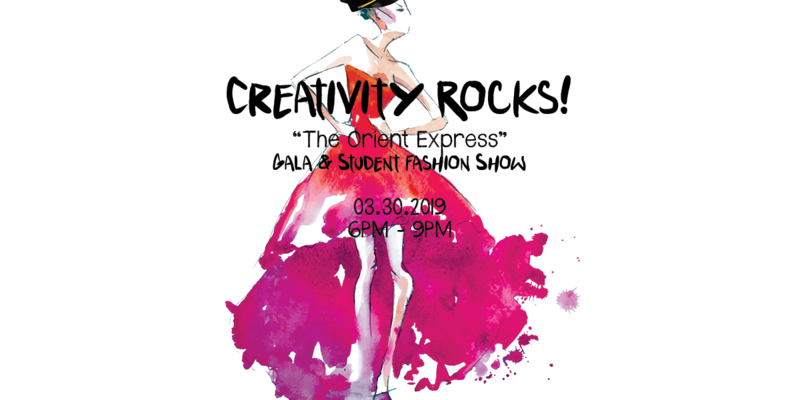 On Saturday, March 30, 2019, the Creativity Shell will host our 4th annual Gala/Student Fashion Show, Creativity Rocks (the theme this year is “The Orient Express”) at the Humble Civic Center. This fashion show will consist of clothing exclusively designed, made and worn by 150+ students who are currently enrolled in our sewing/textile arts and other design programs across Houston. If you have not been to Creativity Rocks in the past, this is a truly unique and memorable experience. The ability to design, make and wear their unique creations on stage in front of an audience is a dream come true for our young designers and we need your help to make this dream a reality. Your tax-deductible sponsorship of Creativity Rocks will help the Creativity Shell expand our programs into more schools and shelters that rescue children from homelessness, trauma, domestic violence and human trafficking. Sponsors will be highlighted with “thank you” rewards including (but not limited to) your company logo on the red-carpet banner, inclusion in the program booklet for Creativity Rocks, the Creativity Shell website, our social media pages, complimentary tickets to the show and the happy faces of the children who continue to thrive in our programs! Creativity Rocks! The Orient Express! The four most prized shells in the world are called the “Glory Of…” shells. With the exceptional beauty and gratitude, you display by supporting the Creativity Shell, you and/or your business will receive a “Glory Of” sponsorship package. * 10 VIP tickets (1 Table) at CreativityRocks. Company name/logo shout out on stage at CreativityRocks! * 10 Premium Economy tickets (1 Table) at CreativityRocks. Company name/logo on signage at CreativityRocks! Company name/logo on letters sent home to parents. * 5 Premium Economy tickets at CreativityRocks! Company name/logo in brochure of CreativityRocks! * 5 Economy tickets to CreativityRocks! * Number of tickets to Creativity Rocks is unique to each sponsorship package. Sponsorship helps to pay for technology and stage package for Creativity Rocks. Company name/logo on Red Carpet event banner. * 10 First Class Tickets (1 Table) at Creativity Rocks. Company name/logo shout out on stage at Creativity Rocks! * 10 Premium Economy tickets (1 Table) at Creativity Rocks. Sponsorship helps to pay for food, advertising and marketing for Creativity Rocks! Company name/logo on signage at Creativity Rocks! * 5 Premium Economy tickets at Creativity Rocks! Sponsorship helps to pay for the costs of table cloths as well as decorations needed for Creativity Rocks. Company name/logo in brochure of Creativity Rocks! * 5 Economy tickets to Creativity Rocks! Sponsorship helps to pay for the costs of materials and supplies needed for students performing in Creativity Rocks! Company name/logo on www.creativityshell.org website. * 2 Economy tickets to Creativity Rocks!